3 bedrooms, 3 bathrooms, sleeps 8. This Granite Ridge cabin is elegant with a mountain cabin feel. You will be surrounded by tall trees and serene atmosphere. The cabin gets it's name "Deer Meadow" because deer are often spotted around the home. This cabin has a great, fully supplied kitchen with two dining areas. Enjoy a game of pool in the game room or just relax on the wood deck. Propane BBQ, picnic table and a great view will insure a great vacation. 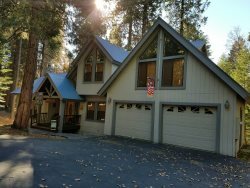 Cabin has 3 bedrooms upstairs with 1 king, 2 queens, and 1 full size bed .The driveway is steep and may require a 4x4 or chains/cables to drive in during winter. Free WiFi. NO PETS. Approx 2,530 sq ft. 2 night minimum required. HOLIDAYS MAY REQUIRE 3-4 NIGHT MIN.